Dental Implants are generally made of bio-compatible materials, with metallic settings, that are placed in the bone to replace lost teeth. Dental implants may be made to replace lost teeth, or can be used as anchors for dentures. A crown is then added to enhance the appearance and functionality. The procedure begins with an examination, x-rays and consultation with the patient. The implant may be made on the next visit, after which a period of time is required for the implant to settle into the mouth. Several months later the crown of the implant is added. 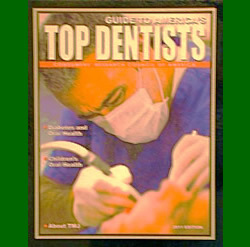 This entry was posted in Implants and tagged dental implants lic, midtown nyc dental implants on July 2, 2013 by Spiderman009. We offer teeth extraction services. Teeth are extracted when they are severely decayed and cannot be restored or saved. Wisdom teeth can be extracted to avoid incurring such decay due to the difficulty in keeping them clean. We use modern anesthetics when extracting teeth. This entry was posted in Extractions on July 2, 2013 by Spiderman009. We create crowns for patients in a number of different situations including cracked or broken teeth, severely decayed teeth and other situations involving dental implants, root canals or bridges. A crown is made of porcelain or metal and used to cap the ‘crown’ of the tooth. Once it is applied, a crown protects the tooth. This procedure will take two visits. Call us today for a consultation. This entry was posted in Crowns on July 2, 2013 by Spiderman009. We can enhance your smile by bleaching your teeth. Teeth whitening is a process that takes careful application of the bleaching dye or you’ll get uneven distribution of the white coloring. We create a special mouth tray that ensures that all areas of the teeth get an even application of the special dyes so you leave our offices looking great. 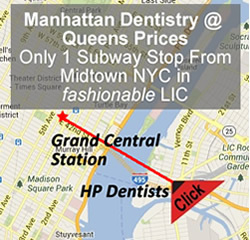 Hunters Point Dental Services offers Manhattan dentistry at Queens prices. This entry was posted in Whitening on July 2, 2013 by Spiderman009. Teeth Whitening. We offer two methods of teeth whitening: 1) Custom Made Mouth Trays and 2) Machine Whitening. The Custom Made Mouth Trays are made from an impression taken of your teeth. The trays are made into molds which you can take home along with a gel and bleach so that you can administer the teeth whitening on your own at home. The Machine Whitening process is administered by us and takes about two hours in our office. Porcelain Veneers. We use porcelain or porcelain and metal veneers to cover the surfaces of teeth to improve appearance. Porcelain or porcelain and metal veneers have a tooth colored appearance and are shaped and bonded to teeth to improve color, augment alignment, restore or improve shape such as repairing wear and tear, fill in gaps, or repair chipped or broken teeth. This entry was posted in Porcelain on July 2, 2013 by Spiderman009.